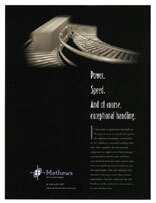 After running our humorous illustration ad campaign for five years, Mathews decided it was time to change direction. They wanted to approach the new e-commerce market with a slicker, more high-tech look. Gray Rambusch came up with a campaign of ads, starkly simple yet powerful, that mimics the look and feel of certain high-end automotive ads.